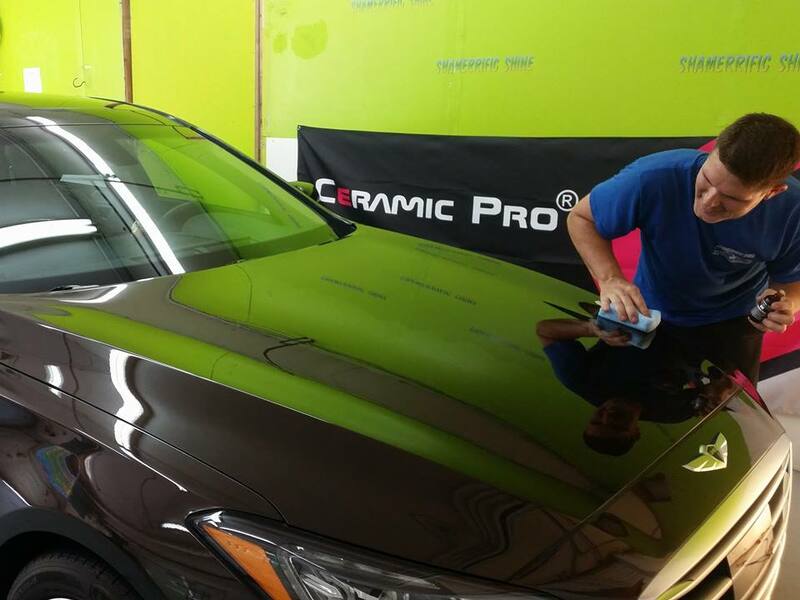 Ceramic Coating and Paint Protection in Overland Park and Kansas City | Shamerrific Shine – KANSAS CITY’S PREMIERE AUTO DETAILING SOLUTION! We offer Ceramic Pro In Overland Park and Kansas City. Looking for Ceramic Coating, Paint Correction or Paint Protection in Overland Park, Kansas or Kansas City area? Well you have come to the right detailing shop in Kansas City Metro. The slickness of the coated surface doesn’t allow dirt, break dust and tar to stick to your car’s paint, wheels or glass. This makes washing your vehicle less labor intensive and less frequent. Waxing is now obsolete. Ceramic Pro once cured, is measured to have hardness above 9H. Normal clear coat has hardness between 2H and 4H. The glass shield prevents minor scratches to your clearcoat and acts as a sacrificial layer. This preserves the original factory paint.